JST President Dr. Michinari Hamaguchi attended the 2019 AAAS Annual Meeting scientific session Competitive Advantage: Protecting the Balance in Africa, Asia and Europe and made a presentation titled "Scientific Cooperation and the 'Asian Union'". Dr. Hamaguchi also gave a speech titled "From Recovery to Growth - Our Lesson from Disasters" at the plenary session Responding Faster and Smarter to New Problems. JST President Dr. Michinari Hamaguchi visited with Dr. France Córdova, Director of the National Science Foundation (NSF). Discussions were fruitful for both JST and NSF, the future seeming ripe with collaboration opportunities. 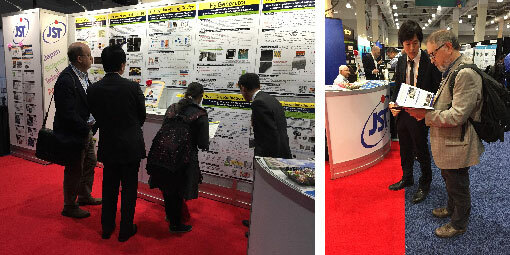 Six institutions - JST, NIED, RIKEN, JAXA, JAMSTEC, NARO - cooperated to hold a joint booth exhibit during the 2019 AAAS Annual Meeting. At the booth we introduced project results for each of the six institutions and our specific efforts towards achieving SDGs using videos, pamphlets, etc. JST President Dr. Michinari Hamaguchi visited with U.S. Department of Energy's Under Secretary of Energy for Science Mr. Paul Dabbar in Washington, D.C.. Active discussions took place on areas of common interest including science and energy and the possibility of future collaborations. At the Materials Research Society (MRS) Fall Meeting & Exhibit held in Boston, JST's Department of Intellectual Property Managament exhibited eight patented technologies and samples close to our organization since the time of filing, and one patented technology of Kwansei Gakuin University. JST with one trainee from Kwansei Gakuin University conducted technical explanations and introduced our organization to visitors. Copyright © 2006-2014 JST Washington, D.C. Office. All Rights Reserved.